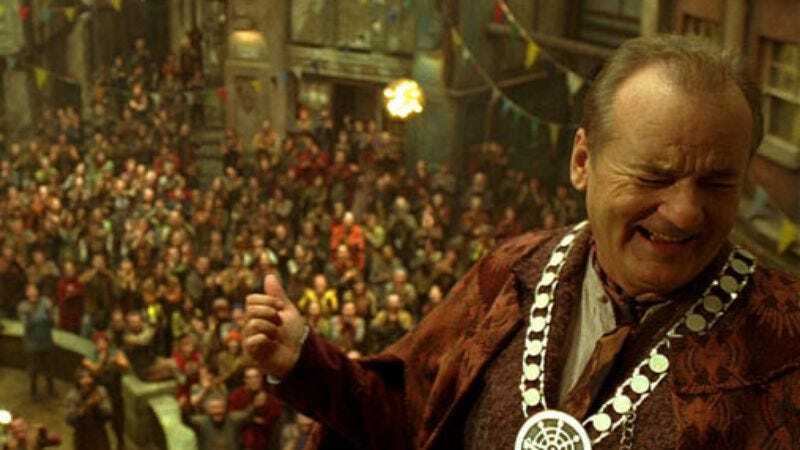 City Of Ember takes place in Ember, a dystopian city of the future constructed deep underground as a safe haven after an apocalyptic disaster renders the surface of the Earth uninhabitable. To remain sane in the absence of sun and fresh air, the non-cannibalistic human underground dwellers immerse themselves in silly rituals and hope against hope that the faltering generator which drives their world won't break down completely and throw their ever-suffering society into chaos. In other words, Ember is eight million miles away from the pandering, shiny likes of Shrek. If it wasn't based on a bestselling children's book, it's doubtful a story this unrelentingly bleak would ever have made it to the big screen. Atonement's Saoirse Ronan stars as a plucky orphan whose job as a messenger leads her to question the underlying power structure of her community and the rule of genially corrupt mayor Bill Murray, especially after she comes upon a mysterious suitcase that reveals the secret history of Ember. Harry Treadaway co-stars as an ambitious young man who joins Ronan in her pursuit of truth and in finding a way out of their underground hellhole. Rounding out the cast are several gargoyle-faced character actors who bear unfortunate resemblances to the outsized moles terrorizing the populace: Martin Landau, Toby Jones, and The Office's Mackenzie Crook. Ronan lends a smart, sober authority to the role of a girl wise beyond her years, but the screenplay doesn't give her much help; she and especially Treadaway are too often stuck playing "The Girl" and "The Boy" instead of more nuanced characters. Murray, on the other hand, delivers a master class in creating an unforgettable character with minimal dialogue and screen time, playing a mayor who's simultaneously creepy, funny, and sad. Director Gil Kenan (Monster House) displays an abundance of craft but not much personality. As a result, City Of Ember often plays like Terry Gilliam lite or second-rate Tim Burton, a filmmaker whom Ember screenwriter Caroline Thompson has worked with extensively. Still, the film's unwillingness to sugarcoat the book's dark world or talk down to its juvenile audience is as admirable as it is rare. Ember is seldom riveting, but it's consistently compelling, and its uncompromising literal and metaphorical darkness renders its climax enormously satisfying.